Yesterday, we published editor Kathleen Merz’s reaction to Soldier Bear‘s Batchelder win. Today, we hear from Laura Watkinson, who translated Bibi Dumon Tak’s novel from the Dutch, about what it was like for her to learn that the book had won such an important award. I’m still gently reeling from last week’s exciting news that Soldier Bear, my translation of Bibi Dumon Tak’s book Soldaat Wojtek, has won the Mildred L. Batchelder Award for “the most outstanding children’s book originally published in a language other than English in a country other than the United States, and subsequently translated into English for publication in the United States” – which really is quite a mouthful. Kathleen Merz from Eerdmans emailed me to say that the award had gone to Eerdmans and Soldier Bear. Seconds later, a message appeared on my Facebook wall from Roxie Munro, a friend and fellow member of the Society of Children’s Book Authors and Illustrators. It was soon followed by lots of other messages from friends who loved the book and the bear and, like me, were delighted to see a translation from the Dutch gaining recognition in the States. There was tweeting, there was Facebooking. . . . The bear was everywhere! One of the nicest emails I received was from Bibi Dumon Tak herself, who was just as pleased as I was that the translation had won such an honor from the American Library Association. Bibi also mentioned that a DVD has recently come out in the UK about Wojtek, and she added that, “Dat beest is hotterdanhot,” which I suspect I don’t need to translate. 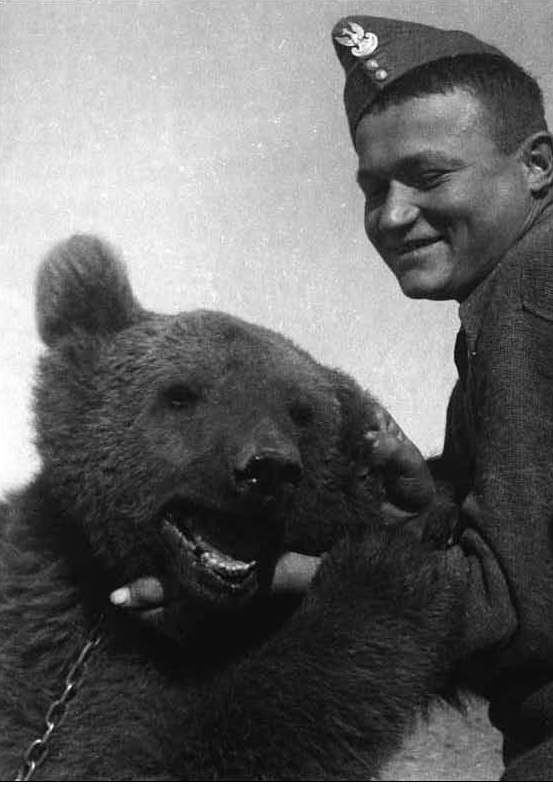 Wojtek, with one of Polish soldiers who cared for him. My mother-in-law is in fact from Edinburgh and actually remembers, as a girl, seeing Wojtek when he was a resident of Edinburgh Zoo. She loved reading Bibi’s story of the bear’s life, and I’m sure she’s not the only person to have been in tears at the end of the book. At that time, when he lived in Edinburgh, Wojtek’s Polish name often appeared in the British press as ‘Voytek,’ and we kept this spelling for the translation, as we thought it’d be a little more straightforward for young American readers. Another familiar name appeared in the Times article: Aileen Orr, the author of Wojtek the Bear, Polish War Hero, which I kept by my side as I translated. It’s a fine read and covers some of the factual background to the bear’s tale and the story of the Polish soldiers in WWII. I’d recommend it to anyone who’s interested in finding out more about Wojtek and his companions, although it must be said that there is some debate about the accuracy of the facts surrounding Wojtek’s story. Wojtek has many fans who are devoted to him and there are a few different versions of the “facts” doing the rounds. So it seems that this marvelous creature, who died in 1962, is still having a positive effect on people’s lives in 2012 and beyond. That bear – yes, he’s hotter than hot! Click here to order Soldier Bear, written by Bibi Dumon Tak, illustrated by Philip Hopman, and translated from the Dutch by Laura Watkinson.